Burbank, Ca – A “Filmmaker’s Journey” is a true story of an obese kid from the Latin barrio who dreams of being a star. 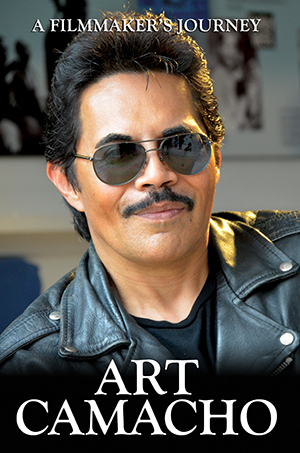 Written by award-winning film director Art Camacho, this autobiography provides a personal view of growing up Latino in America, the path he took to get into the movie industry, the failures he faced, the bullying he endured and the defining moment that led him to Hollywood. “As a whole, we Latino-Americans tend to lower our expectations of ourselves. Instead of dreaming for a brighter future, we find ourselves settling for a bleak reality. There is so much talent and passion in my community than we realize if only we allow ourselves to dream beyond what is in front of us and work towards those dreams. I wrote this book with intention of sharing my journey, warts and all. To show others, that they too can reach for the stars and live their dreams,” notes Art Camacho. Through his own life experiences, “A Filmmaker’s Journey” is Camacho’s lifelong journey from a young, obese, depressed and bullied kid who did what it took to follow his dream. It is a book about inspiration and over-coming countless failures and despite the roadblocks generated not just by society, but by our own selves and our own culture. Camacho is a highly acclaimed award-winning film independent filmmaker with a career spanning over 25 years. Considered a leading martial arts and action film director, his credits include Half Past Dead, Assassin X, X-Treme Fighter, Little Big Foot and many more. “His Life’s story is both poignant, uplifting, told with a sense of irony and humor. It is an inspiration to every young kid who dreams for something more than just what others expect of them. It is about facing life challenges head on and breaking through,” points out co-author Michael Matsuda, who is also the president of the Martial Arts History Museum. For information about Art Camacho or the Martial Arts History Museum, visit MAmuseum.com. A portion of the funds collected will benefit the museum which is located at 2319 W. Magnolia Blvd., Burbank, CA 91506.